flower color. With semi-woody stems, this member of the mint family is drought tolerant and trouble-free.The leaves of this Central Asian native are aromatic when crushed. Most plants reach between 3 and 5 feet tall. While considered hardy in zones 5-9, it struggles where the summers are hot and humid. While most plants sold are listed as P. atriplicifolia, many are hybrids that are more properly named P. x hybrida. Regardless of their botanical name, they are a great choice for a water-wise garden.Several cultivars are available. 'Blue Mist' has paler blue flowers than the species. 'Longin' has a more upright, narrow growth habit. 'Little Spire' gets only about 2 feet tall, with an upright habit. The leaves of 'Filigran' are more finely dissected than the species, giving it an airier appearance. the growing season. Space plants 2-3 feet apart. Prepare the garden bed by using a garden fork or tiller to loosen the soil to a depth of 12 to 15 inches, then mix in a 2- to 4-inch layer of compost. Dig a hole twice the diameter of the pot the plant is in. Carefully remove the plant from its container and place it in the hole so the top of the root ball is level with the soil surface. Carefully fill in around the root ball and firm the soil gently. Water thoroughly. CARE:If plants are too floppy, try pinching them back by half in early summer when they are about a foot tall. Cut back plants to about a foot in the fall or leave standing for winter interest. Then cut back to about 6 inches in the spring. Plants at the northern end of their range may be killed back to the ground; in milder areas more of the top growth will survive. Wait to see how much wood had made it through the winter before cutting them back hard in the spring. In long-season areas, if flowering stops after the first flush of blooms, cut back plants by half to encourage a second flush of flowers. 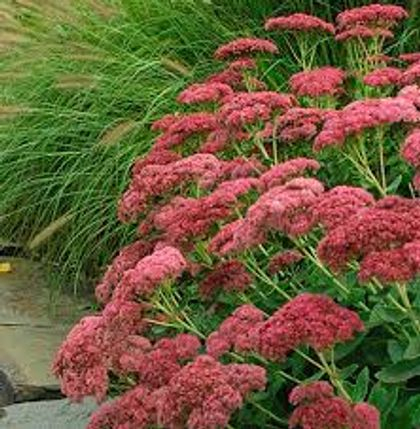 Water newly set-out plants if the weather is dry; established plants are quite drought tolerant. 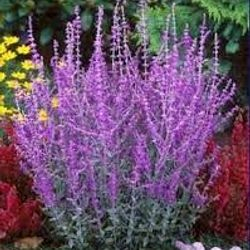 Salvias are a large group of garden plants that includes annuals, biennials, perennials, and shrubs. The perennial salvias are mainstays of the midsummer garden border. Another common name is sage.About This PlantA relative of the familiar kitchen sage, flowering salvias produce spikes of small, densely packed flowers atop aromatic foliage. 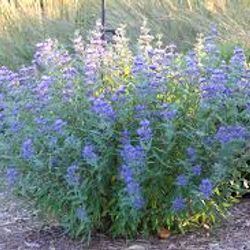 These heat- and drought-tolerant beauties bloom from early to late summer in shades of blue, violet, red, pink, and white. Plants grow 18 inches to 5 feet tall, depending on the variety. 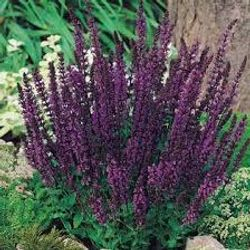 Use care when choosing salvias, because not all plants are hardy in all regions. PLANTING TIPS:Select a site with full sun and very well-drained soil.Plant in spring, spacing plants 1 to 3 feet apart, depending on the variety. Prepare the garden bed by using a garden fork or tiller to loosen the soil to a depth of 12 to 15 inches, then mix in a 2- to 4-inch layer of compost. Dig a hole twice the diameter of the pot the plant is in. Carefully remove the plant from its container and place it in the hole so the top of the root ball is level with the soil surface. Carefully fill in around the root ball and firm the soil gently. Water thoroughly. CARE:Apply a thin layer of compost each spring, followed by a 2-inch layer of mulch to retain moisture and control weeds. Water plants during the summer if rainfall is less than 1 inch per week. Some types can be sheared back after flowering to induce a second flush of flowers in fall. After the first killing frost, cut stems back to an inch or two above soil line. Divide plants every 3 to 4 years as new growth begins in the spring, lifting plants and dividing them into clumps. CARE:Apply a thin layer of compost each spring, followed by a 2-inch layer of mulch to retain moisture and control weeds. Water plants during the summer if rainfall is less than 1 inch per week. After the first killing frost, cut stems back to an inch or two above soil line. Divide plants every 3 to 4 years as new growth begins in the spring, lifting plants and dividing them into clumps. ABOUT THIS PLANT:The Smoke Tree is most widely known for its large billowing summer blooms that have a puffy cloud-like or "smoky" appearance. The large blooms provide an attractive characteristic as they wisp in the air with a gentle summer breeze.The smoketree is most widely used as a specimen tree, with its attractive "smoke-like" inflorescences appearing in early to late summer. As clusters of tiny blooms fade away in the late spring, this plant shoots out hairy-like filaments, producing an attractive "smoky" billowing plume. Selections include varieties with green or purple foliage, changing to shades of orange, red, or purple in autumn. It has a rounded form, growing approximately 10 to 12 feet high and wide, but sometimes as tall as 20 feet. It is hardy in Zones 5-9.
size and mix in a shovelful of compost when planting. When setting your plant, be sure that the top of the root ball is slightly higher than the grade surrounding the perimeter of the dug hole. Fill the remainder of the hole with well drained soil and water. CARE:Once established, a heavy spring pruning can help force the most colorful new growth for a display of color and multiple shoots. Keep in mind that dry summer conditions promote a very showy and vibrant fall color to your smoketree. `Royal Purple´ variety is well known for its deep purple foliage and red-purple autumn fall color. The new growth of `Golden Spirit´ emerges bright gold, changing to lime green in summer and shades of orange and red in fall. PLANTING TIPS: Plant in spring or fall. Space plants 2 to 15 feet apart, depending on the expected mature size of the plant. Dig a hole only as deep as the root ball and 2 to 3 times as wide. If your soil is in very poor condition, amend the soil you've removed from the hole with a small amount of compost. Otherwise don't amend it at all. Carefully remove the plant from the container and set it in the hole. Fill in around the root ball with soil until the hole is about half filled. Then firm the soil and water thoroughly. Fill the hole with the remaining soil and water again. Form a raised ridge of soil around the perimeter of the hole so it acts like a berm to help hold in water. 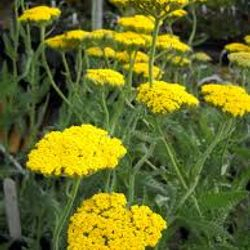 ABOUT THIS PLANT:Yarrow is a hardy and versatile perennial with fernlike leaves and colorful blooms. The large, flat-topped flower clusters are perfect for cutting and drying.Most yarrows grow 2 to 4 feet tall, although low-growing varieties are also available. 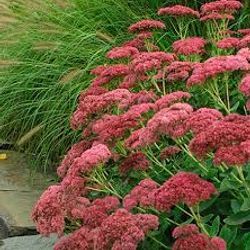 The plants are remarkably durable, tolerating dry spells and low soil fertility where other perennials would fade. Yarrows bloom from midsummer into fall; flower colors include red, pink, salmon, yellow, and white. Yarrow are versatile and look equally at home in a perennial border, sunny rock garden, or wildflower meadow. Powdery mildew disease may be a problem in humid areas.Yarrow is easy care/low maintenance,multiplies readily,good for cut flowers,attracts butterflies and tolerates dry soil. surface. Carefully fill in around the root ball and firm the soil gently. Water thoroughly.